Meteor scatter (MS) is the reflection of radio signals from the ionised trails from Meteors (Iron Rocks) burning up in the upper atmosphere. This effect can be used by radio amateurs to make contacts at distances of up to around 2,200km. 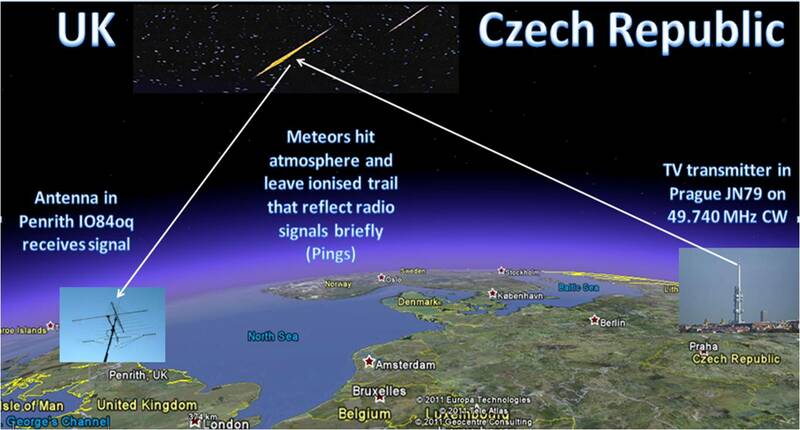 Meteors burn up in the atmosphere at a height of between 90-105km. 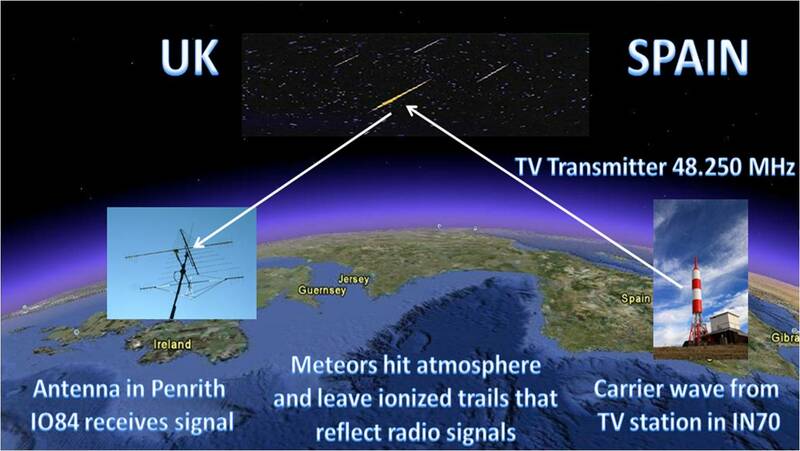 The ionised meteorite trail will reflect VHF radio signals, which would otherwise travel straight into Space. Meteor Scatter radio contacts rely on multiple meteors to reflect small parts of each message over a period of time, usually around 20 minutes, but sometimes up to 1 hour. The mostly metallic (iron) meteors burn up in the atmosphere and leave an ionised trail of particles, which VHF radio signals can bounce off, for any time period from 100 milliseconds to over 2 minutes. The frequent time for reflections is often around 250 milliseconds or just a quarter of a second! You haven't time to speak normally, so you can use a series of audio tones to represent each letter of the alphabet and play this through your radio using a computer soundcard. You speed up the tones so that your short message instead of lasting perhaps 20 seconds, is transmitted in under 0.25 seconds, repeatedly over and over again. Imagine a spy radio 'burst transmitter' sending a secret Morse Code message at hundreds of letters per minute very, very quickly to avoid detection and direction finding by the enemy! The techniques used for Meteor Scatter communication speeds are quite similar. The receiving station listens and when a meteor is in just the right place he/she will hear your signal and then they slow your message down again to read it, using their computer soundcard and WSJT software. You take it in turns to transmit and receive in set periods of every 30 seconds. Over 20 minutes, on average, the entire message is transferred in both directions to complete the contact. In this time maybe 4-6 meteors will occur. Meteors may come at any time, but sometimes they come in showers, which can be predicted. During showers there are more meteors than usual and QSOs (contacts) are easier to make. Most work on 144 MHz is done during Meteor Showers. A MS trail reflects 50MHz for longer time than 144MHz, so it is easier to work MS on 50MHz. Actually you do not need to wait for a MS shower at all to make QSOs, you can arrange skeds via the ON4KST 50/70/144/432 MHz online Chat. 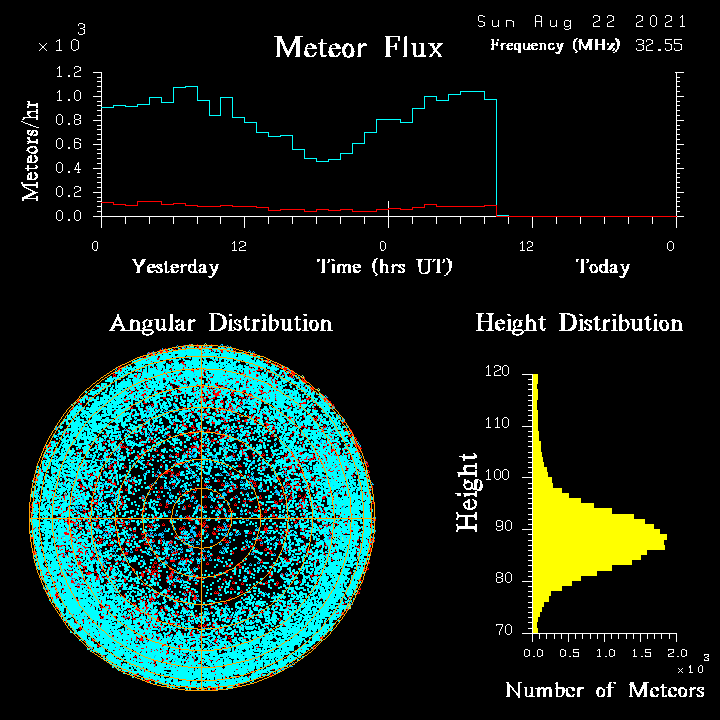 Meteor Scatter signals sound like brief enhancements of the signal you are listening for. Out of the noise pops your QSO partner at 59+ for mostly less than a second, but then he fades fast away again. Sometimes bursts are many seconds long and you may be lucky to make a QSO in one burst. But as ever on VHF you have to be fast.. When transmitting signals within the Amateur Radio VHF bands you should prepare yourself to make the QSO in small bits of mostly a few seconds. There is a procedure for MS-QSOs agreed on in IARU Region 1. If we all follow it, the QSOs are much easier. Southbound and Eastbound transmissions should be made in the 2nd period. This will avoid you causing QRM by transmitting when other local amateurs are listening! This guide is often ignored by stations who are unaware of it and results in havoc, with you trying to listen for weak signals at the same time that a nearby strong station is transmitting. (However for stations in central Europe it can be difficult to comply because different stations in the same Country may be working to the West and the East at the same time, so you should arrange a scheduled QSO on a frequency away from 50.230 MHz or 144.370 MHz in that case). Most European MS activity was seen here in 2016, but in 2017 has declined dramatically in favour of MSK144 mode on 50.280 MHz. 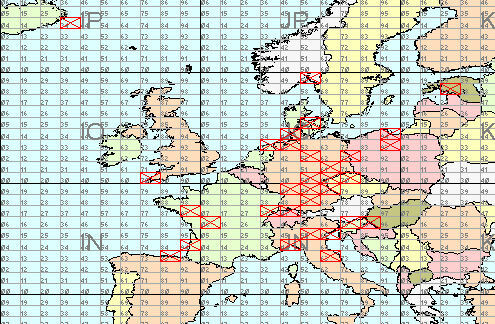 *The new Region 1 (European) band plan, that came into effect on 1st January 2012, is largely being ignored by the VHF community, as all data modes in Europe were recommended to move above 50.300 MHz to free up space for more SSB voice, however 50 MHz is often capable of Intercontinental communications and there remains much US JT65 data activity below 50.300 MHz so that is where European stations remain to work them. Most meteorites have a significant iron metal content and when they burn up in the atmosphere at heights between 85-90 km they leave behind metallic ionised trails which reflect VHF signals back to Earth, that would otherwise be lost in space. Signals are typically of very short duration, but can be strong typically from -2 to +13db. During the most intense meteor showers the duration of signal reflections and be several minutes or even hours and can be confused for Sporadic-E propagation. Summer months are best for the major showers, but winter months are active too. Random meteors occur all the time, day or night, and there are far more meteors than can be seen visually. Can be a mode that can revolutionise 50/70/144 MHz SSB contacts using software such as WSJT or MSHV by LZ2HV (latest MSK144 mode with 15 second intervals, very popular in 2017) for long distance contacts. My favourite propagation type! 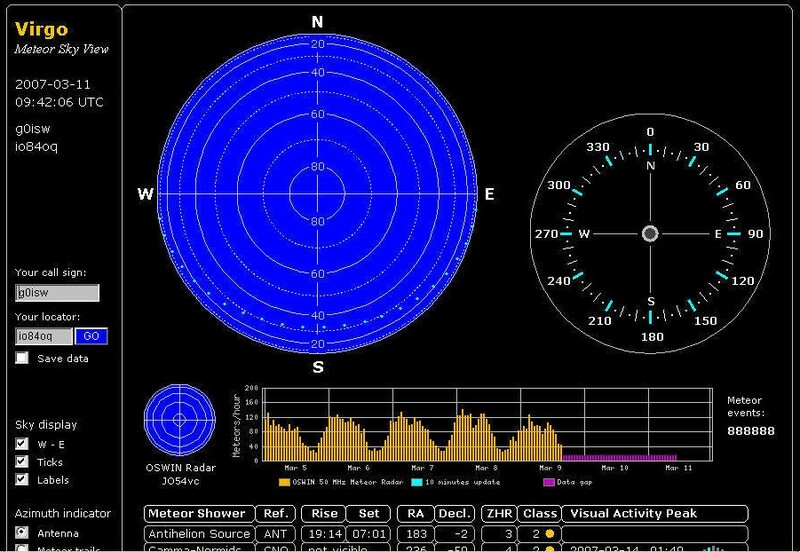 The lowest distance 200 km MS contacts can be very difficult to complete due to the high angles required, fewer meteors trails being in just the right place and nearby radio signal obstructions such as mountains, mid distance MS contacts around 600-1000 km being far easier. Whilst most stations use directional horizontal beams and 100W or more, success can be achieved with omni-directional antennas such as horizontal loops and surprisingly even with vertical colinears. Reflections of radio signals can last from around 250 milliseconds (1/4 of a second) to 30 seconds plus, but the vast majority are extremely brief. It can take a long time to complete a QSO in the region of 30 minutes or an hour, unless there is a major Meteor shower. In November 2002 the Leonids shower was the best ever with over 700+ meteors each hour. So many meteors were striking the atmosphere that an almost continuous reflective layer was formed with amazing easily completed verbal QSO's, almost like Sporadic-E signals that lasted for many hours continuously. For Meteor Scatter the 50 MHz band is by far the best, 144 MHz is usable too but more difficult and 432 MHz and higher almost unheard of. To easily hear Meteor pings tune your transceiver to a distant strong VHF Band 1 TV station video carrier or VHF FM Radio station and you will hear nothing until the signal is reflected briefly by a passing meteor! Please note that during the Summer months Sporadic E (Es) may allow you to hear the TV or radio carrier continuously. The Spanish TV Transmitter shown above, closed down in 2010, but in 2011 the TV Transmitter in Prague shown below was active. Sadly almost all Band 1 TV stations are closing down, replaced by UHF digital instead. Unfortunately Band 1 analogue TV is being phased out in Europe and so the availability of these TV carriers is being much reduced for monitoring Meteor Scatter. There are some alternatives, such as the French GRAVES space surveillance radar system on 143.050 MHz CW. It is also possible to carry out some interesting Radio Astronomy using the signals from Band 1 TV carriers and your Radio receiver to detect Meteor reflections and create imagery of the fireballs or meteors burning up in the atmosphere using SpectrumLab software. I used to record radio detected Meteor Shower ping activity on 55.250 MHz over several years using the excellent and reliable data from Dave Swan, however I have had to stop for a couple of years due to the primary transmitter in Portugal closing down. Dave in 2013 is now back again using 143.050 MHz. The table below shows the recorded data and is useful for working out the best dates for MS propagation, albeit random meteors occur at any time. Please note that there are far more radio reflections and of longer duration at 55 MHz compared to 143 MHz, so in the table below 2004-2010 are 55 MHz observations and 2011 onwards are 143 MHz observations. The demise of Band 1 TV transmitters on 48 MHz and 55 MHz has effectively destroyed the best means for radio meteor observation sadly. If only here in the UK we could setup some replacement CW amateur radio transmitters in the far North and South to provide a reliable constant alternative as are in use in Belgium. UK Radio Meteor analysis shows that the best times for working random Meteor Scatter is between 0000-1300hrs with few meteors outside these times, obviously Meteor Shower peak times do differ from this general rule. I have found operating FSK441 for random Meteor Scatter during the afternoon and early evening has not been as good, but DX can be worked with perseverance. Full Meteor Shower list can be found here. An excellent website dedicated to the study of live Meteor reflections is that of G7IZU. 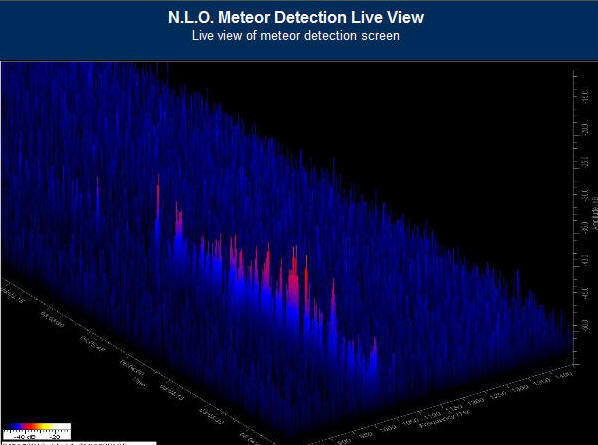 Below - Dave Swan's (G1BLO) radio meteor reflections at 55.250 MHz and live observation histogram at 62.1927 MHz as received in the UK, a very good indicator of meteor activity. The Geminids meteor shower peak on 14th December 2003 can be clearly seen at 0400hrs UTC on the December 2003 chart shown below. When calling CQ with FSK441A (WSJT) on 144.370 MHz most amateurs have adopted the method of sending 'CQ 385' which indicates they are calling split by transmitting on 144.370 MHz BUT listening on 144.385 MHz for replies, this avoids congestion. When the original station hears your reply on 144.385 MHz they then QSY to 144.385 MHz and both stations complete the QSO on .385. They do not work split after the CQ is answered. 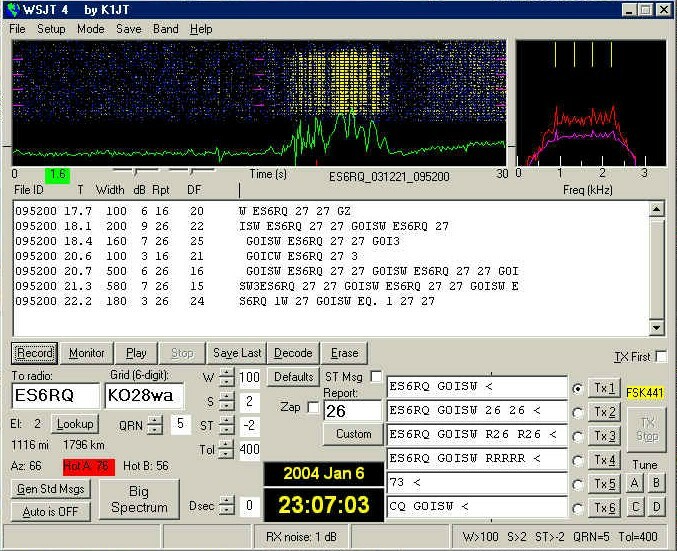 Shown below is a still image of my FSK441 QSO (using WSJT software) with ES6RQ on 21.12.2003 on 144.360 MHz a distance of 1116 miles and my best DX via Meteor Scatter so far. The burst captured below shows the signal I received from my friend 'Ants' in Estonia. I was only using 50 watts with my FT-847 and a 9 element Tonna Yagi at 150m asl to reply and you can see my MS signal report received in Estonia of 27. A map of Stations I have worked on 144MHz Meteor Scatter from IO84 is shown below. The maximum practical range for MS QSOs is considered to be around 2300km, with my best distance so far being 1796km. I have managed to work stations via MS in Iceland, France, Germany, Poland, Estonia, Czech Republic, Italy, Switzerland, Croatia, Bosnia, Serbia, Slovenia, Norway, England, Holland, Denmark & Spain. Antennas: Most stations use directional long yagis mounted on rotators, with significant gain for MS contacts, I have used antennas with slightly larger beam widths and less gain such as Log Periodics or currently Omni directional horizontal loops in recent years. I have witnessed on air in 2014 a few stations using vertical collinear base station aerials to good effect for MS contacts which surprised me very much, but clearly can also work. The exchanged signal reports were also much better than expected and not a lot different to other stations! © Copyright G0ISW. Page last modified 13th December 2018. All Rights Reserved.